Experimenting within quantum theory is an extremely complex process, where common intuitions are regularly inverted within shifting reality. Over the years several quantum features and methods of their study have been identified. Now scientists have investigated a new set of assumptions and proposed a novel experiment, to test the consequences of making quantum theory more intuitive. "While quantum theory is the science behind almost all of our technology, its disconnect with our everyday intuitions is still worrisome and actively researched," says lead author Associate Professor Daniel Terno. "How do you find your way in a reality which is shifting, where the opposites are allowed to coexist? Moreover, how do you conduct experiments in it? These are the questions that must be answered when dealing with the floating world of quantum mechanics." 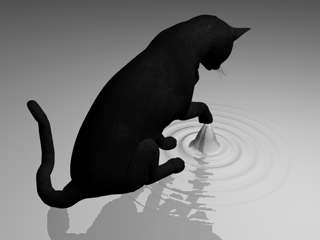 Throughout the development of quantum theory, a set of reasonable ideas has led to strange paradoxes, such as the famous Schrodinger's cat, which is neither dead nor alive. Another of the most famous (and useful) results of quantum mechanics is that every object can behave as a particle or as a wave, given the right conditions. Associate Professor Terno and colleagues proposed a new experiment in 2011, which was realised by dozens of research groups worldwide. This proposal made complicated experiments much simpler, such as an experiment formerly requiring 40 meters of optical cable now being performed on just a single chip. In taking these assumptions and applying them to an experiment, where the measuring device is controlled by a Schrodinger's cat-like state, the research team reached some perplexing paradoxes. "Only after the cat was found to be dead or alive were we able to tell if what we did was to look for a particle or for a wave," says Associate Professor Terno. "Then these three innocent-looking ideas result in predictions that would contradict an experiment. The universe simply does not work like that: you can see things to be real, or certain, but not both." Then the researchers tweaked their initial assumptions, replacing the third assumption with the requirement that how you set your detectors does not affect the system you study before they interact. This tweak lead to another strange result: it is not only that our quantum world is not like that, but such a combination cannot be realized in any universe. "We can just repeat after Alice: things get curiouser and curiouser." Don't understand why people keep beating a dead cat or even worse a live one. It was a thought experiment, a gedankenexperiment. Schrodinger's equations are used with certain, verifiable results everyday by chemists. It seems that the physicists from Copenhagen are still freaked out, probably because there isn't a Newton or an Einstein among them. It appears that many people desperately need to believe what their mind's perceptions tell them over what science tells them. And they intend to bend science until it gets it right. This is what is meant by the need for QM to "make sense." They simply refuse to see that it does make sense. Hickory, dickory, doc, three mice ran up the clock. And now Schrodinger's cat has the lot! It's all a computer simulation. Courage and open-minded skepticism will get you far. The key words are that we cannot determine the state of the cat until we observe it. That, in and of itself, indicates that the cat is in the final state before we observe it. That the cat is hidden from view before we observe it is beside the point. Perhaps this "paradox" simply indicates the natural tendencies of humanity to fantasize about what is beyond the limits of our observation. He says things can be real, or certain, but not both. Everybody dies. That's real, and it's certain. I'm real, and I'm about to drink the last drop of coffee out of this cup. That's real, and it's certain. I can roll a die. That's real and it's certain. It may not be "certain" evidently which side lands up, but the event is both real and certain, even in cases of "randomness". I'd be interested to see if a proton, or an entire atom, could be made to behave as a Photon-like particle in a double-slit experiment. The problem here is we've all been wrong, and seen the double-slit experiment as a paradox. It may be that Photons are simply able to be in two places at once, and there's nothing contradictory about it. Shrodinger's cat can be shown to be a classical problem. You wouldn't know if the cat were dead or alive regardless of QM, so you aren't actually testing QM by this thought experiment. A probability wave is not the same thing as a mechanical wave. One is a statistical calculation, the other is a real thing. I've even realized that "reverse time entanglement" is a valid solution to classical, newtonian dynamics. This sometimes occurs when you solve a quadratic equation. The "negative" delta-time solution is usually discarded as "rubbish," because we never observe anything at a macroscopic level which looks like "reverse time". However, it could easily be used to try to explain reverse time entanglement experiments entirely classically. This occurs in a "QM" experiment where they have apparati and have "entangled" several elements. They wait a random number of days and make changes to the elements in a certain set of rules, and discover that the future choices supposedly changed the initial conditions. Well, there's a kinematic equation in classical physics which can produce solutions where an event's "end" happens before it's beginning. I wish these people would find a more humane way to test their theories. Where's PETA when you need them? In the 90's I came up with an axiom that I use evaluating problems with numerous theoretical solutions and in determining how close a solution might be. I call it Dugger's Axiom. The short version is that for any given problem, the more you know about the subject of the problem - creates an inverse ratio with the number of theories that can be proposed for its solution. This means the reverse is true as well - the less you know about subject of the problem the greater the number of plausible solution theories that might be proposed. While Dugger's Axiom doesn't provide quantifiable insights, it does provide a general perspective regarding the state of knowledge regarding a specific problem and generally how far ahead a solution might lie. The number of theories regarding quantum problems in general suggests we still have quite a bit more to learn, but not as much when compared to say the number of different religions on the planet. Probability is a mathematical representation of the boundaries of our ignorance of what is, what is not, and what will be. Once the probabilistic event happens, the event and the outcome are "real", but the other "probabilities" which did not come to pass are not "real". Indeed, some of them may in fact not even have been "possibilities" in the real world, because our ignorance of the true underlying laws may have causes us to miscalculate what was "possible", and what the "probabilities" of those "possibilities" was. Returners: Look up 'fullerene diffraction'. Some people have indeed done double slit experiments with fullerenes, which are large balls of carbon atoms that look a bit like a microscopic soccer ball. "Mythology, comparative religion and Ancient, Medieval and Far Eastern history feature among the latter." Quantuum mechanics isn't weird, nor uncertain, nor paradoxical. It's simply and beautifully decribed by Schrodinger. We really should call it that; Schrodinger's world, not QM. All the strange stuff happens when we make measurements. Tunneling, dualism, superposition are ALL the outcome of classical-like measurements that I think we should start calling it Newton's world. This is much like others here have said. We make it hard by making it hard, and we then pass this onto our students.